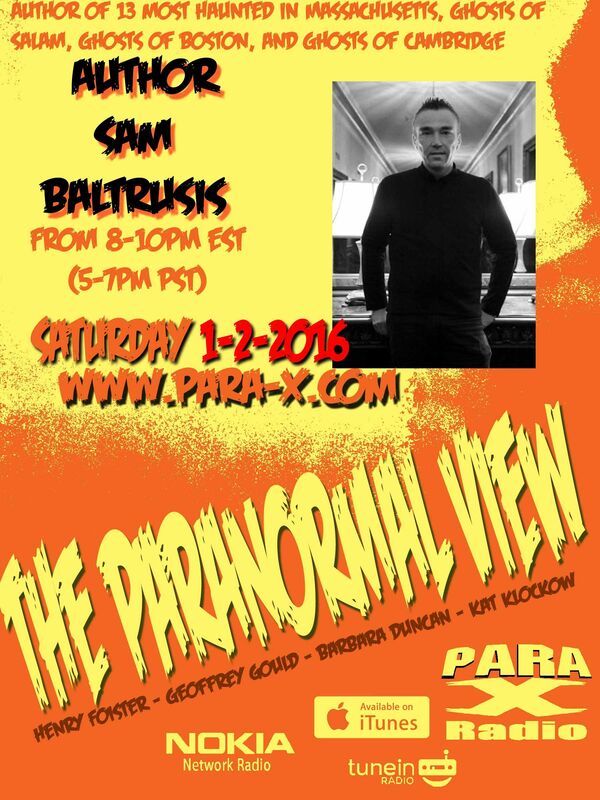 Tonight our guest was paranormal investigator Sam Baltrusis, author of 13 Most Haunted in Massachusetts, et al. We started out talking about the haunted Victorian S.K. Pierce Mansion. Early in the show Kat and I had a few audio issues in our respective headsets. Briefly touched on was the New York city haunted Jane Hotel, where Titanic survivors stayed. Discussing various aspects of living in Massachusetts, Kat and Sam got into the weirdness that is the Bridgewater Triangle. Henry almost stumped Sam asking after the Dighton Rock, as aspect of the Bridgewater Triangle. Sam clarified he "avoided" Salem and Lizzie Borden's area. Sam spoke about the Mary Lou Arruda murder case, as well as, being in Salem notwithstanding, the Joshua Ward House. Allegedly haunted by a "witch," the Josha Ward House actually gave to Sam a scratch across his chest. Sam also spoke about the sadistic Joshua Ward, the most hated man in Salem. After the second break, Ceiling Cat Barbara Duncan reported tonight our having listeners in the US, the UK, Canada, Saudia Arabia, Australia, Phillipines, Costa Rica, and Unknown. She asked about, and Sam spoke at length about creepy Spider Gate Cemetery in Leicester. We spoke about the Jonathan Corwin House aka the Witch House of Jonathan Corwin. As Kat has visited there, the USS Salem was discussed. Sam felt S.K. Pierce Mansion was the most Active place he's visited, while the USS Salem is high on the list. He's working on a book on New York City haunting book, so he knows Snug Harbor is pretty Active. He told CC how checking out the hospital on Ellis Island was too strong for him to want to investigate. Sam gave out each of his books' websites: 13mosthaunted.com, bostonhaunts.com, cambridgehaunts.com, and ghostsofsalem.com. While he didn't give out his loadedgunboston.com website, or his Twitter, Henry mentioned Sam being on Facebook. I gave out my website's Paranormal View hub page, indicating people from there can find the show's respective report pages and previous show archived podcasts, my @realbadger Twitter, my being findable on Facebook. Kat gave out the show's @Paraviewradio on Twitter, her Jinxed Comic site, which also has a @jinxedcomic Twitter page, along with her @KatKlockow Twitter account, though not her own official website. We can be contacted by email, the official show page is at Paranormal View, and previous shows are available on iTunes, and we wrapped out. 02 January 2016 The Paranormal View.